A set of homemade bookends is a suitable beginner woodworking project. Homemade wooden bookends make excellent gifts and can be used in bookshelves, on the mantle or on free-hung shelves. Bookends are a terrific starter project you can do with friends or your kids for a simple introduction to woodworking. Just gather up some scrap wood and basic hand tools. The platform created by the basic L-shape of the design can be decorated any multitude of ways for an adaptable project that can be done over and over and still remain fresh. You can add a piece of metal to slide under the books to hold them more securely, but the piece is optional. Measure your wood and mark off matching sections to create your wooden L. A good size is 4-by-6 inch rectangles for the upright portions of the bookends, and 4-by-4 inch squares for the feet. 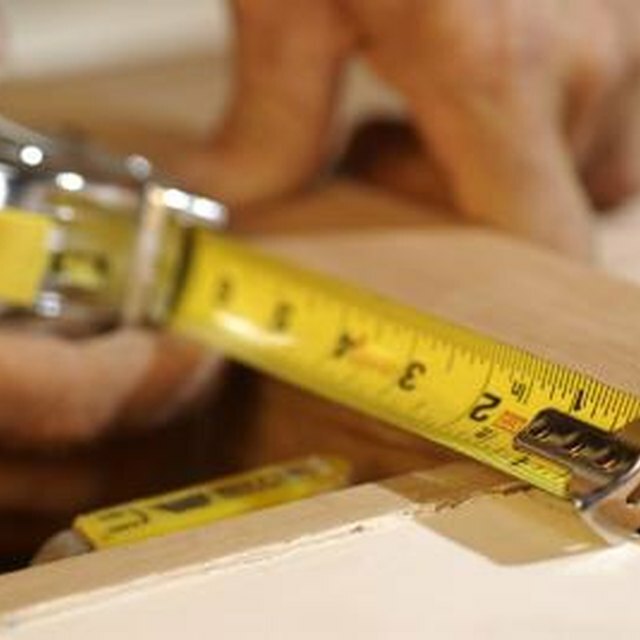 Measure twice, and use a carpenter square to outline your pieces. Using a jig or miter saw, cut pieces of wood evenly. You can use the saw to round the top corners of the bookends if desired. Sand the wood edges smooth, and stain or paint to your liking. Position the precut pieces in the shape of an L. Use a clamp fastened securely to the table to hold the pieces together. Use the 1/8-inch bit to drill a pilot hole through the back of the L into the foot, about 1 inch from the corner. Do the same for the other side. Use the 1/8-inch screws to fasten the back of the bookend to the foot. Do this for both bookends. At this point you can opt to add a small metal corner brace to the bookend to create a backwards facing footer that slides under the books for greater stability. Choose a brace that is very thin metal so it will slide under the books with ease. It will need to be a few inches long for utility. For bookends with the added metal foot, position the metal corner brace in the center of the wooden back so the bookend sits upright and level and the metal foot extends backward from the wooden L shape. Clamp the metal brace to the wood. Use the 1/16-inch bit to drill pilot holes using the holes in the brace as a guide. Use the 1/16-inch screws to screw the wooden back and the metal footer together. Do this for both bookends. You can use a small chisel to remove a small strip of wood the same width, height, and depth of the metal brace on the inner face of the bookend for the metal brace to fit into. This will allow the bookend to sit flush against the books with no gap. You can also add felt to the bottom of the bookend and metal piece to prevent scratches to your bookshelf. Decorate your new bookends by painting a design on their outer face or by mounting a decorative item on the footer of an all-wood bookend. You can also carve their outer face, stain them, use varnish to attach and coat a leaf or dried flower, or spray-paint the bookends with a metallic paint. L-shaped bookends are the easiest to make. After creating a few sets of simple bookends, you can branch out and try creating bookends that are more complex.